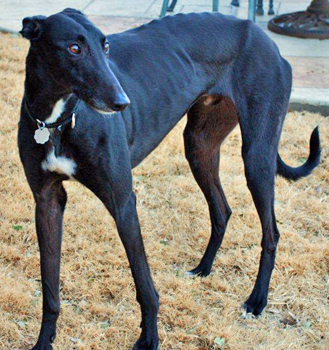 Phantom, aka Fiscal, is a handsome 3-year-old black male born December 3, 2007. His sire is Fuzzy's Cannon, and his dam is Sylvania, who is GALT's own Sylvia. Phantom is full sibling to Cash. Phantom has 7 races to his credit on Greyhound-data.com, all at Gulf Greyhound Park in La Marque, Texas from November 15, 2009, to November 20, 2010. 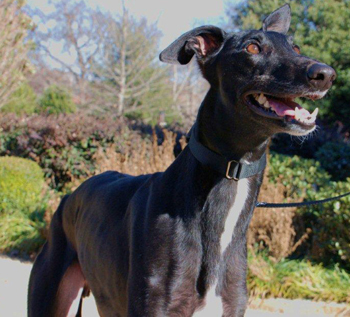 So Phantom, like Cash, is ready to find his forever home and family! Phantom is not cat trainable and will be tested with small animals at a later date. 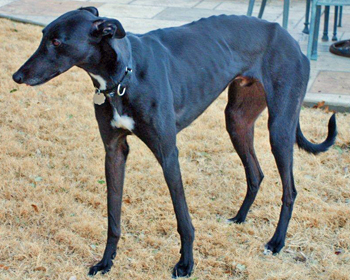 Phantom is a very relaxed boy who loves to chill. He also likes his playtime with toys, especially balls. He sleeps soundly in our bedroom at night with our other dogs, and has no personal space issues. He barks when he needs to go outside to do his business. He loves mealtimes and eats quickly - we feed him separately so he's not tempted to check out the other's food bowls before they're finished. He crates well during the day when we're gone, with just a few barks at first as if to say "Are you sure you have to go?" This boy would love to sneak into your heart and life!